Jaggi Vasudev (Sadhguru) has loyal followers and a good name, but some may wonder if the Guru is genuine or not? The hand can reveal the truth about his character. 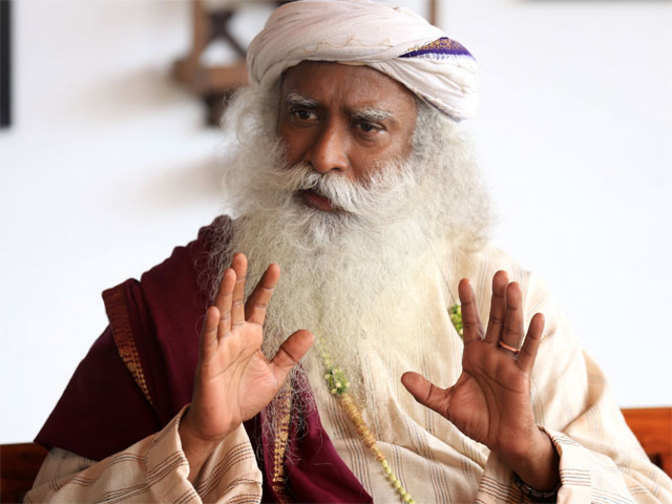 Sadhguru has a strong thumb with a broad will phalange, a deep Heartline, a wide and well developed Venus mount, a broad palm, and fingers on the shorter side. The mounts on his palm are developed, but not excessively. All this indicates a person who is warm, with a love for all humanity and balanced in his emotions. It shows the qualities of loyalty, generosity, and complete engagement and faith in what he is doing, a broad outlook, and understanding of larger issues. diplomacy seen from his thumb. Minor faults one would reckon. He is shrewd, but his manipulative abilities are limited, if they exist at all. Overall his hand shows that he is quite straightforward. Check out a hand photo of his here, or here. I am also posting a sketch of a hand photo sent to me by a reader. Where money is concerned, the shape of his fingers (tips, phalanges, thickness) clearly show that he has financial sense and business ability which is above average. The contradiction arises because his Headline indicates an introspective and non-materialistic attitude. The shape of the Headline and developed Moon mount suggests that this is his basic nature, (introspective) but becomes more so in the second half of his life. The fingers and mounts indicate an action-oriented person who avoids excesses, both of mind and body. The shape of Sadhguru's hands and fingers shows that he is a pragmatic personality who does not set store by blind faith, religious rituals or superstition. Not being a manipulative person, it's extremely unlikely that he will pretend that he is taken in by "religious" tamasha. This makes him a trustworthy person even though he is not a typical ascetic. His hands show will-power and determination. His thinking may not always be logical, but he has good reasoning powers and can be persuaded. Plus, he is fairly balanced in his emotions, as well as an independent thinker and doer, and this is clearly evident from the way he holds his fingers. (Jaggi Vasudev, known as Sadhguru, is an Indian Yogi guru who has founded the Isha Foundation). Or try the label Spiritual leaders for hand readings of Spiritual Leaders from different parts of the world including the Pope, the Ayatollah, the Dalai Lama, Mother Theresa and also Mahatma Gandhi, Sai Baba or Dr. Sarvepalli Radhakrishnan. Fascinating and very insightful. A lot of what's discussed in the article seems consistent with how I know him from discourses on youtube, etc. His broad outlook and understanding of larger issues are something I find characteristic for what he talks about. There are also some surprising elements that came forward. Overall your hand reading matches beautifully with what I would expect from his personality. About his lack of diplomacy. Can this be interpreted as a tendency not to conform too much to formalities? A certain subversive attitude? When I was living in Coimbatore, people asked me to go to Isha foundation. My friends came from other parts of India to visit him and asked me to join them. Somehow, I didn't find the inspiration to do so! As my knowledge on spiritual matters is limited, I don't want to pass any comments! Thanks M. Glad you liked the post. Am not sure about why he is direct. Could be many reasons for it. A forcefulness of personality perhaps? DI, thanks for the comment. I too have little knowledge of gurus so I know what you mean. was looking forward to this. I found sadhguru a 'guru' with difference.Thought he was either a master manipulator or a true guru. Kindly tell me,is he really an ascetic? Similar to Sri Sri Ravi shankar and Osho? What was the main difference you find in their palm,since they all have been hailed as 'gurus' at one time or other. He is not a typical ascetic as I mentioned in my post and that is because he enjoys the pleasures of life (but within reason) and he also has a way with money (but not greed). The palm of say Osho and Sadhguru are worlds apart, there is really no comparison. However if one leaves aside their character/personality/ethics etc, then one can say that Osho and Sri Sri could have a higher intellect although Sadhguru's hands do show that he has a philosophical and thinking bent of mind. What there is no doubt about is that Sadhguru is not a master manipulator, at least that is what I see on his hands. What really makes a true 'guru' is very difficult to define and it can be a subjective thing. Ascetics are different and very rare in this day and age. Nita,given your analysis- he's just an eloquent philosopher and a humanist and not an ascetic? "A person who renounces material comforts and leads a life of austere self-discipline, especially as an act of religious devotion"
"Leading a life of self-discipline and self-denial, especially for spiritual improvement". or "Pertaining to or characteristic of an ascetic; self-denying and austere"
Generally speaking an ascetic (at least to my mind) is someone who is not interested much in food or drink, sits and meditates for hours and hours and is in a way cut off from the physical world including all material comforts. However if to your mind an ascetic is someone who is philosophical and humanistic, then I am sure you can think of Sadhguru as an ascetic. Your analysis about Sadhguru's personality is spot-on :). One can see his lack of diplomacy in his debates with Javed Akhtar as well as in some of his interviews (especially with superficial anchors in Indian media). To me, Sadhguru is just an amazing Being. His message about God etc. is very simple "Neither believe nor disbelieve. Be open-minded to any possibility. Act according to your common-sense and intelligence at any time. Simply enhance your perceptions through disciplined practice of Yoga, Meditation, and Humanitarian acts"
In the 10 minute "Describe God" video, (link below), he appears to be the most "logical" of all the religious leaders, especially what he says from 6:09 to 7:21, and from 2:23 to 3:52 in the video. His approach to God (around 8:03 in the video) seems most "practical/logical" approach to God for today's intellectual people at least. Do you have a clearer image of his palm? I take photos from the web. I personally have no images. May I suggest that that Sadhguru had "a hand" in designing his own hand? He worked, by what he himself has shared, for several lifetimes to accomplish the creation of his great determination, the energy center which, at long last, he was able to manifest during his current lifetime.He returned as Jaggi Vasudev with the inbuilt abilities to complete his mission at last. I am not referring here to someone who is still caught up on the wheel of action and reaction so much as to a person of moksha who returned to our plane with a sole and conscious purpose. This is not a conclusion on my part, for I know nothing; rather this is an observation and perhaps a question. The narrow quadrangle which you speak of is not present at the age he is now. It is present only for the first half of his life. 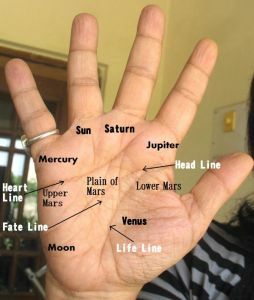 That said, to say that people with narrow quadrangles are bigots is completely wrong, and if any hand reader says this, then I will say he is a poor hand reader/palmist. I have never heard of Kattakar but have lost respect for whoever he is. I have read the hands of many people with narrow quadrangles, none of them are bigots. There are also some well known bigots who do not have a narrow quadrangle. It is very important to see the shape of the hand before one makes pronouncements about personality characteristics. 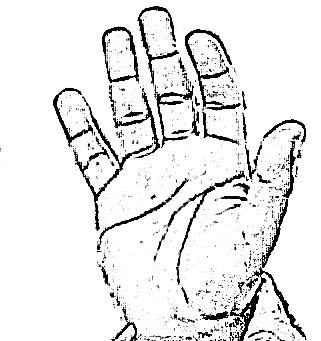 The shape of the hand is the context in which one has to read the hand. A narrow quadrangle can show a person who is less open to another's views (not bigot) but one has to see the headline shape and length but even before one can say that he is incapable of seeing another point of view. And of course the shape of the hand as well. 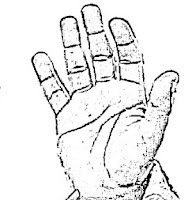 The hand is to be read as a whole, and just one line or sign cannot be taken out of context. On this website I have given the example of a doctor examining his patients and taking into account several symptoms. For example a rash on the body can mean so many things, it does not necessarily mean typhoid. Excellent palm reading. I love watching Sadhguru's lectures on YouTube and I'm glad his palm complements his loving nature. Thank you for this reading, Nita.